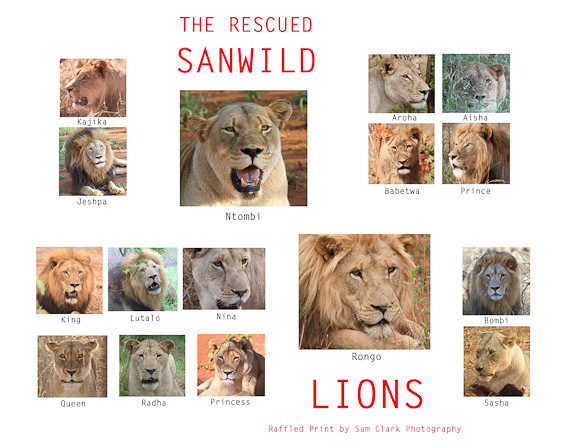 MEET THE LIONS… OF SANWILD! These Lions have been rescued from Canned hunting by the SanWild Wildlife Sanctuary in South Africa! The Lions are constantly in need of care. To help them I have decided to raffle one of my Fine Art Lion Prints, with 100% of funds being donated to these magnificent animals. 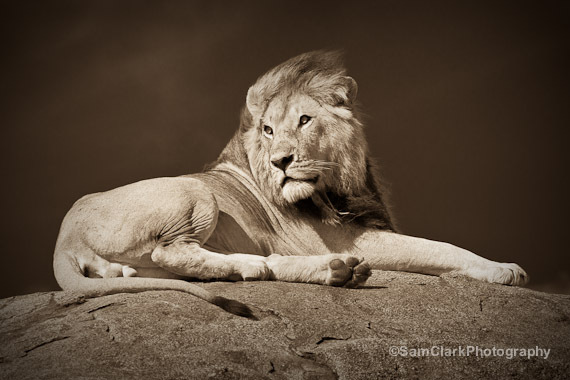 If you would like to be in with a chance to win this print while helping the SanWild Lions, you can enter for as little as $2. Increase your chances with multiple entries. To enter, please navigate to the right of this page and click on the link ‘Make a Donation to SanWild Wildlife Sanctuary’. With your help, these beautiful Lions have the opportunity to live out the remainder of their lives in a natural bush setting, in peace! Thank you for your kindness! Since the Cooke Report revealed the horrors of canned lion hunting to the international world in 1997, the SanWild Wildlife Trust in conjunction with the Wildlife Action Group have been actively fighting to rid South Africa of this despicable and cruel practice. Where most animal welfare charities have limited their involvement and action against this industry to writing letters, canvassing media support and organizing petitions, SanWild has given refuge to the innocent victims of canned hunting directly – the lions themselves. For the first time ever, a non-profit animal welfare group committed themselves to take care of three prides of lions that had nowhere else to go. Previously, these lions had nobody that cared enough to take action to ensure their long-term welfare and allow them to live as natural a life as possible. When Jespha’s pride arrived at SanWild, it was the first time this pride of lions could live without fear of being separated from each other, without fear of having their week-old cubs removed from them and without fear of a hunter’s bullet. In addition to ensuring the prides’ daily welfare, feeding and cleaning and supplying veterinary care when necessary, the SanWild Wildlife Trust also continued to run local and international information campaigns to inform the world about the horrors of breeding lions for hunting purposes only. Without any consideration for the personal sacrifices needed, trustees and supporters of both the SanWild Wildlife Trust and the Wildlife Action Group worked for many hours lobbying media support, actively funding and initiating information gathering about the canned hunting industry. In hindsight, it is easy to see that it all came down to the love that a single pride instilled in the hearts of us here at SanWild. The beauty of the black-maned Jespha, the love between a lioness and her cubs, the trust that all will be “okay” was clearly reflected in the pride members’ yellow eyes. The love we developed for the pride made our personal sacrifices worthwhile. Being representative of the thousands of lions held captive on lion breeding farms (sometimes under the most appalling conditions), the small group of rescued lions at SanWild became animal welfare icons. They continue to serve as a constant reminder of how good people worked tirelessly and put a small dent in a horrific industry which has flourished in a country that has turned a blind eye to the unethical and cruel practices of canned hunting under the banner of so-called “sustainable utilization”. Since the first group of confiscated lions arrived at the SanWild Wildlife Sanctuary, many internet browsers, donors and advocates of animal welfare have come to know the lions by the names given to them by supporters of this non-profit animal welfare trust. Jespha, Nikana, Ntombi and their two new-born cubs, Rongo and Aroha along with their sisters, Sasha, Radha and Nina represented a period of hope for the thousands of lions being held captive on many lion breeding farms in South Africa, waiting to be killed as hunting trophies. Sadly, the continued destruction of these beautiful creatures seems imminent as the South African government’s intentions have become crystal clear: “Canned lion breeding and hunting has become an acceptable part of the sustainable utilisation of our wildlife and is here to stay”. Jespha’s pride also represented a time where it was hoped that animal welfare NGO’s could work hand in hand with official nature conservation departments to ensure the welfare of the innocent animals that became the silent victims of a greedy and heartless society supporting trophy hunters who would stop at nothing to feed their obsession to obtain a lion trophy. However the helping hand from the animal welfare community was simply ignored. While love for these particular lions grew in the hearts of many international donors, it became evident that the formal conservation departments cared very little about the animals’ welfare. While international donors kept the animals fed and paid for their care and veterinary treatment, the conservation departments on the other hand simply regarded the lions as commercial entities to be traded (and hunted if necessary). When they finalised the prosecution of the lions’ breeder, the conservation department wanted their “pound of flesh” In order to obtain this, in November 2005, Jespha’s Pride was placed on public tender to be sold to the highest bidder. As SanWild was deeply concerned for the animals’ welfare and safety, we felt it our duty to institute legal action to prevent the lions from being sold to the highest bidder. As a result of our proceedings, Jespha’s pride was removed from the tender documents. Private investigations into the highly unethical, but lucrative trade in the captive breeding and canned hunting of large predators has proven beyond doubt that the conservation authorities have allowed canned hunting to continue unpunished in South Africa. While those in power continued to play their political games and the conservation departments squabbled around the issue of captive lion breeding and hunting like a group of confused vultures, yet another pitiful group of lions arrived at SanWild after the Asset Forfeiture Unit had confiscated them following a criminal investigation. The AFU punishes criminals that have profited from illegal activities by seizing their assets and turning such assets into money for government coffers. Although the AFU’s main objective is to ensure that assets are sold off as effectively as possible and for the best price possible, they agreed to sell the group of lions, including a tame male to the SanWild Wildlife Trust in the best interest of the animals. Donor funding was raised to purchase the animals and to this day, the Royal Pride has been living in a large holding enclosure at the SanWild Wildlife Sanctuary. I’m really loving the theme/design of your website. Do you ever run into any browser compatibility issues? A small number of my blog visitors have complained about my website not working correctly in Explorer but looks great in Opera. Do you have any suggestions to help fix this issue? I haven’t come across any compatibility issues that I am aware of. Maybe there is an error in your HTML code. You could try Google for a solution, or get your web designer to look at it. Hope this helps!